The series is focused on the life and criminal exploits of ignominious Columbian drug lord Pablo Escobar and the thrilling hunt for his blood. Where can you stream Narcos? On 2015-08-28 Crime/Drama TV Series Narcos first aired on Netflix. 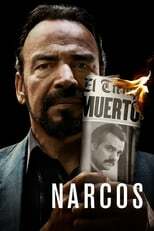 Written and created by Chris Brancato & Carlos Bernard, and produced by Gaumont International Television, Narcos has ended and last broadcasted on 2017-09-01.